Modeling, Control and Coordination of Helicopter Systems provides a comprehensive treatment of helicopter systems, ranging from related nonlinear flight dynamic modeling and stability analysis to advanced control design for single helicopter systems, and also covers issues related to the coordination and formation control of multiple helicopter systems to achieve high performance tasks. Ensuring stability in helicopter flight is a challenging problem for nonlinear control design and development. This book is a valuable reference on modeling, control and coordination of helicopter systems,providing readers with practical solutions for the problems that still plague helicopter system design and implementation. Readers will gain a complete picture of helicopters at the systems level, as well as a better understanding of the technical intricacies involved. 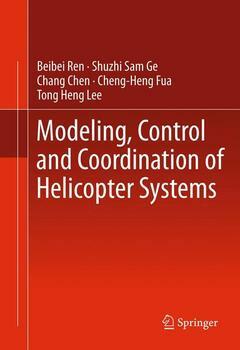 Presents a complete picture of modeling, control and coordination for helicopter systems. Provides a modeling platform for a general class of rotor-wing vehicles that can be applied to not on traditional single main-rotor helicopter, but also unconventional rotary-wing aircraft. Discusses algorithms for multiple helicopters meant to achieve high performance tasks considered highly impractical. Modeling, Control and Coordination of Helicopter Systems is an ideal book for academics, researchers and engineers who are interested in modeling, control and coordination of helicopter systems and autonomous systems in general as many of the techniques and concepts could be extended further and applied directly to many other systems of interest. Introduction.-Building a Nonlinear Rotary-wing Aircraft Model.- Stability Analysis for Rotary-wing Aircraft.- Â Altitude Control of Helicopters With Unknown Dynamics.- Altitude and Yaw Control of Helicopters With Uncertain Dynamics.- Attitude Control of Uncertain Helicopters with Actuator Dynamics.-Kinematic Formation Control Using Q-Structures.- Dynamic Altitude Synchronization Using Graph Theory.